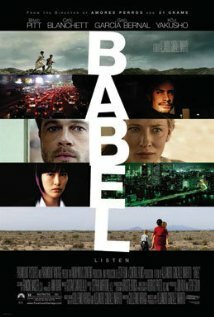 — The movie has a subtle allusion to the Biblical account of the Tower of Babel, where it must have gotten its title. I heard a number of tongues spoken. One can't survive this movie without subtitles. — Director Alejandro Gonzalez Inarritu has created quite a masterpiece: four seemingly independent stories weaved into one. The film spans different countries and cultures—America, Mexico, Japan, and Morocco. These stories happen in one time period. — Here's a rough, chronological guide to the story. A Japanese businessman goes to Morocco for a hunting trip. He gives a rifle to his guide as a tip. The guide sells the rifle to a neighbor, who lives in a shepherding community. The neighbor needs it to kill that jackals that often attack the sheep. The neighbor has two boys who help him out in the trade. To pass time, the boys test the rifle. Because of sheer stupidity, I suppose, the boys shoot a tourist bus. An American is wounded, at risk of losing a significant amount of blood. The American's husband breaks the bad news to the Mexican nanny, the one looking after their two children in San Diego. Because she doesn't want to leave them, the nanny takes the children along with her attend her son's wedding in Mexico. Meanwhile the international community thinks the Morocco shooting is a terrorist plot. The news reaches Japan, where authorities are looking for the original rifle owner. He has a deaf-mute daughter, whose mother just committed suicide. She has lots of personal issues, and she pours her heart out to a police officer. — Doesn't the story remind you of the line from a Joey Ayala song, Ang lahat ng bagay ay magkaugnay (Everything is connected to everything else)? — Notable scenes include Cate Blanchett, the American tourist, throwing the ice off her glass for fear of contracting an enteric infection. She's later subjected to possibly contaminated wound stitches by a local healer. Also: Brad Pitt, playing as the American husband, breaking down in tears when he hears his son's voice over the phone. — A moving scene that reminds me of overseas Filipino workers: the nanny (Adriana Barraza) asking about the children's condition during the interrogation with the American authorities. The stern, heartless officer only answered: "That's none of your business." The nanny bursts in tears, saying she has raised these kids like her own. She will never see them again. — At one point, I'm irritated by the Moroccan children. Why shoot people when they can gun down—I don't know—trees? And then I realize, they're just boys who don't know any better. I used to be, and sometimes still am, one myself. — The film shows many contrasts: the First and Third Worlds, the weak and strong, and especially, compassion and indifference. — Hours after watching the film, I am still stunned. I highly, highly recommend it.